All transactions are safe and secure with a reliable history in online purchasing behind each of our associates. 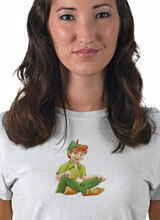 Buy the Peter Pan Sitting t-shirt to own Peter Pan clothing and merchandise. Available in men's, women's, kids' sizes and hoodies. It is the boy who never grew up! This Peter Pan t-shirt features the boy himself, who can take little Wendy Darling's breath away. You can typically find him sword fighting Captain Hook, flirting with mermaids, flying around the world or saving princesses from Skull Rock. Most people envy this character because of his ability to do whatever he wants, whenever he wants. He doesn't have to answer to grownups or spouses, and he has no responsibilities to take into consideration. Sound good to you? Then get in on the action by grabbing any of our Peter Pan tees or Tinkerbell shirts. In addition to the Peter Pan Sitting tee above, browse the Peter Pan Clothing Gallery for more apparel like men's and women's clothes, kids shirts or hoodies.